How little did I know the accuracy with which they would reflect our feelings the first few weeks. Being a first time parent is overwhelming for everyone. It is the nature of the beast. That’s why there are blog posts, websites, and even doctor’s visits designed to help you through it. Insert pithy remark about how if it were easy men would do it alone. I’ve said before how we don’t have much of a support system here but we do have a great couple as our best friends. So, the first few weeks were a little different than I’d always expected. My parents had come out for the birth and the first week or so. 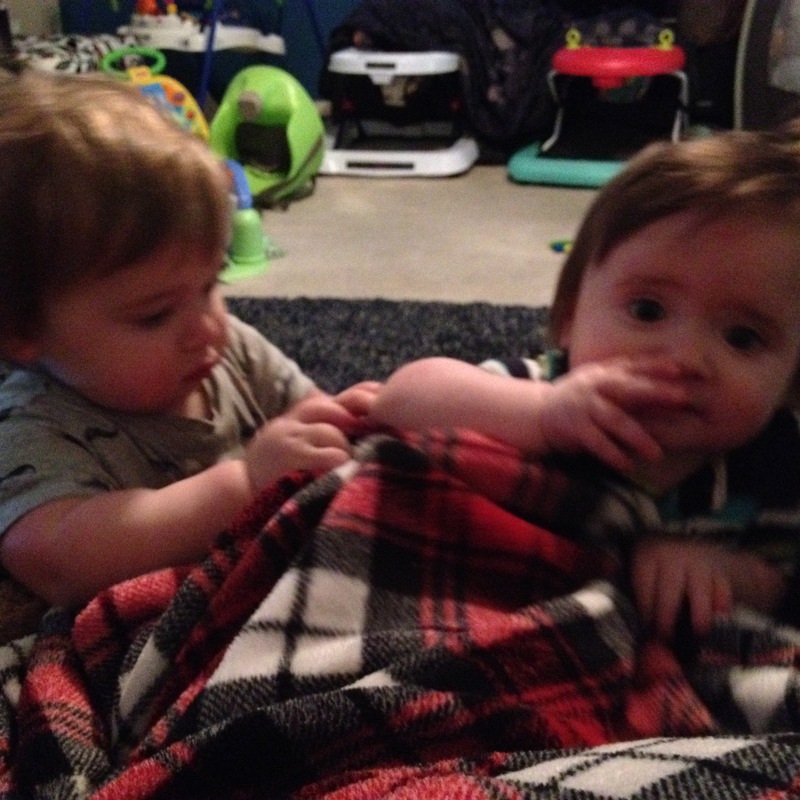 The plan was for them to be here to help give me time to recover, give them time with the boys, and maybe even give Mr. Scents and I some time together away from the babies. That changed the day I delivered; my mom found out she her work needed her back in two days. We went home on Labor Day to our dog and my dad. Our neighbors and good friends brought us some good BBQ and helped us welcome our little ones home. The terror set in as they left. Now what? That first night was weird, to say the least. On one hand you’re home so things kind of feel normal until you have these little mouths wanting food every 2-3 hours. I was just starting a routine down when things went downhill. Horrifically, my dad said that he felt we were good to go, so he left on Wednesday, when he was supposed to stay until Friday. That was after me asking him to stay and tattling to my mom. In stepped panic mode. After my dad walked out the door I looked at these two sleeping, for the moment, babies and cried. I’m sure a lot of that was postpartum hormones but it doesn’t change that feeling of abandonment I still feel. I’m very much a do-it-myself-type person, so the fact that I reached out for help in and of itself was a miracle on proportion to the whole water into wine. I think the first month my boys were home I went to bed each night with a ball of anxiety in my stomach and the words, “How are you going to do this,” on my lips. After that time we had settled into our uneasy routine. As I wasn’t able to breastfeed so we were able to take shifts. I had the 6-4pm shift, Mr. Scents the 10-6am shift. This meant that we both were getting a good 8 hours of sleep each day. The bad part was we rarely were together to ease our anxieties or commiserate. The short time we were both up each day went to grocery shopping, laundry, cleaning, and giving each other needed breaks away. We felt that we were each drowning in a sea of dirty diapers and crying babies alone. Looking back, I’m still not sure how we got through it all. That’s not true. Our good friends were there for us. They would come over to keep us company and help care for the boys. They would go to the store for us. And most importantly they were a shoulder to cry on/complain to. Looks like it was not easy, but you made it through. Kudos to your strength! Not easy but well worth it. I love those onesies. So cute and accurate. Our twins were our second and third children, but we still were unprepared for all the challenges. I’m obsessed with onesies! My little guy has dozens of them. this on is adorable!! Those are very cute onesies! Very cute and so glad that everything worked out well for you! Those onesies are really cute. Glad you made it through everything ok.
Tell me about it! Having twins will consume you entirely. I remember for the first week, the only sleep I can get would be a maximum of 5 minutes. Lol. For sure, it must be hard to be a first-time parent. But with the support and help of the family and friends, it can be worked out. Most parents decide to take a leave from work to be able to adjust their routine and spend more time with the baby. We don’t have family where we are and only one couple that is reliable with help. We have managed, although it’s been over 9 months since I’ve been alone with my husband. we love onesies… so cute and affordable for kids. Cute family! Cute onesies. Having twins can be so tiring, but totally worth it. Somehow we always find a way to work it all out, don’t we? It is very hard in the beginning though! For sure. We’re still working things out but it’ll be nice when I can actually spend time with my husband again. Those onesies are super :). When my boy was at “onesies” age I was obsesed buying to much of them…I just find the onesies the cutiest clothes ever :).